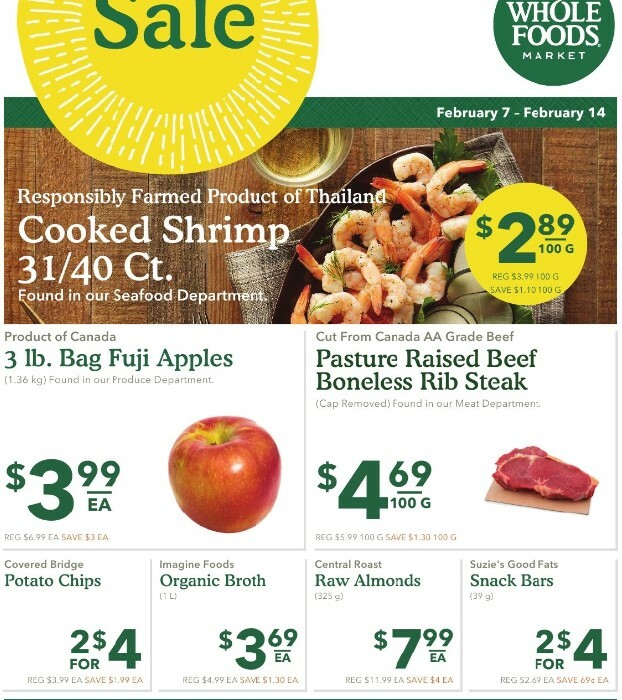 Whole Foods Canada Flyer February 7 - 14, 2018 - Cooked Shrimp $3.99 Regular Price $2.89/100 g Sale Price $1.10 Savings Responsibly farmed product of Thailand. 31 / 40 ct. Found in our seafood department. Fuji Apples $6.99 Regular Price $3.99 Sale Price $3.00 Savings 1.36 kg. Product of Canada. Found our produce department. Pasture Raised Beef Boneless Rib Steak $5.99 Regular Price $4.69/100 g Sale Price $1.30 Savings Cap removed. Cut from Canada AA grade beef. Found in our meat department. Frontera Gourmet Salsa $5.99 Regular Price $4.69 Sale Price $1.30 Savings 454 g. Found in our grocery department. 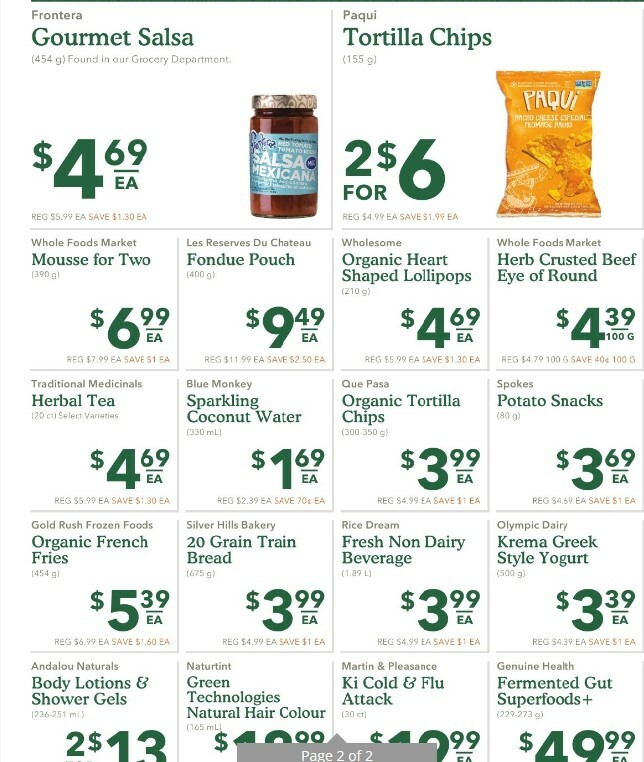 Whole Foods Canada Flyer Whole Foods Market Mousse For Two $7.99 Regular Price $6.99 Sale Price $1.00 Savings 390 g.
Traditional Medicinals Herbal Tea $5.99 Regular Price $4.69 Sale Price $1.30 Savings 20 ct. Select varieties. Gold Rush Frozen Foods Organic French Fries $6.99 Regular Price $5.39 Sale Price $1.60 Savings 454 g.
Silver Hills Bakery 20 Grain Train Bread $4.99 Regular Price $3.99 Sale Price $1.00 Savings 675 g.
Blue Monkey Sparkling Coconut Water $2.39 Regular Price $1.69 Sale Price $0.70 Savings 330 ml. 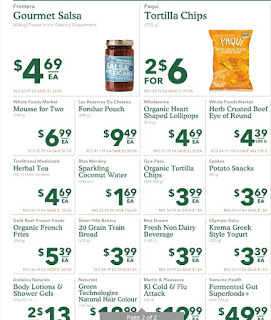 Les Reserves Du Chateau Fondue Pouch $11.99 Regular Price $9.49 Sale Price $2.50 Savings 400 g.
Whole Foods Flyer Paqui Tortilla Chips $4.99 Regular Price 2/$6.00 Sale Price $1.99 Savings 155 g.Wholesome Organic Heart Shaped Lollipops $5.99 Regular Price $4.69 Sale Price $1.30 Savings 210 g. Rice Dream Fresh Non Dairy Beverage $4.99 Regular Price $3.99 Sale Price $1.00 Savings 1.89 L Que Pasa Organic Tortilla Chips $4.99 Regular Price $3.99 Sale Price $1.00 Savings 300 - 350 g. Rice Dream Fresh Non Dairy Beverage $4.99 Regular Price $3.99 Sale Price $1.00 Savings 1.89 L Olympic Dairy Krema Greek Style Yogurt $4.39 Regular Price $3.39 Sale Price $1.00 Savings 500 g. Whole Foods Market Herb Crusted Beef Eye Of Round $4.79 Regular Price $4.39/100 g Sale Price $0.40 Savings Covered Bridge Potato Chips $3.99 Regular Price 2/$4.00 Sale Price $1.99 Savings Imagine Foods Organic Broth $4.99 Regular Price $3.69 Sale Price $1.30 Savings 1 L. Central Roast Raw Almonds $11.99 Regular Price $7.99 Sale Price $4.00 Savings 325 g. uzie's Good Fats Snack Bars $2.69 Regular Price 2/$4.00 Sale Price $0.69 Savings 39 g.